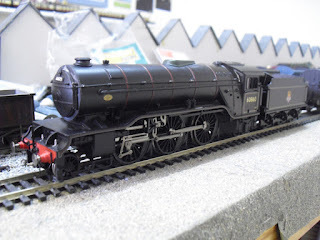 THE BRITISH RAILWAY STORIES LTD: "Some Bachmann V2 bashing..."
It's not unfair to say we've been waiting a long time for the definitive ready to run Gresley V2 model, and it looks like with the latest Bachmann offering, we'll have to wait a little longer. 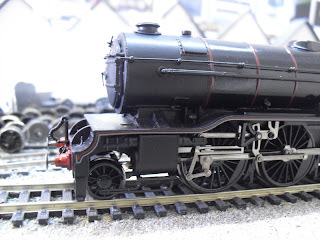 However, there are some modifications which can be made, which were discussed, talked out and modelled on the Bachmann V2 thread on RMweb which produce a much improved product. As it stands, the Bachmann V2 out of the box has a better chassis and paint finish, but the old tooling is still lacking the accuracy to make it a decent representation of a V2. The following modifications are by no means unique to me and I do not profess to have thought them up myself (bar the cylinder modification - that is wholly mine!) but they are useful for producing a Gresley V2 which is a vast improvement on the base material. 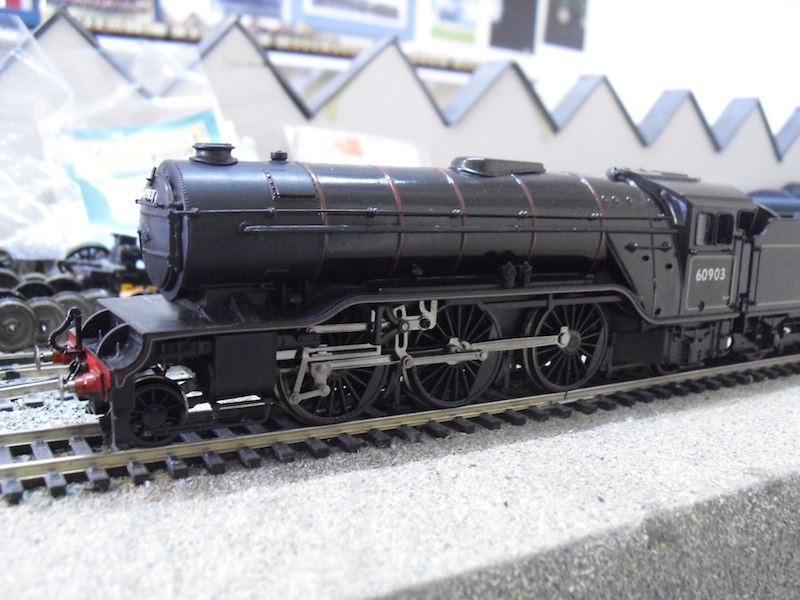 So, in the above photograph (taken yesterday, as per everything up to "Final Bits and Bobs"), my sample of the latest Bachmann V2 is shown after Hornby A3 buffers, chimney and coupling are trial-fitted, using blue tack. 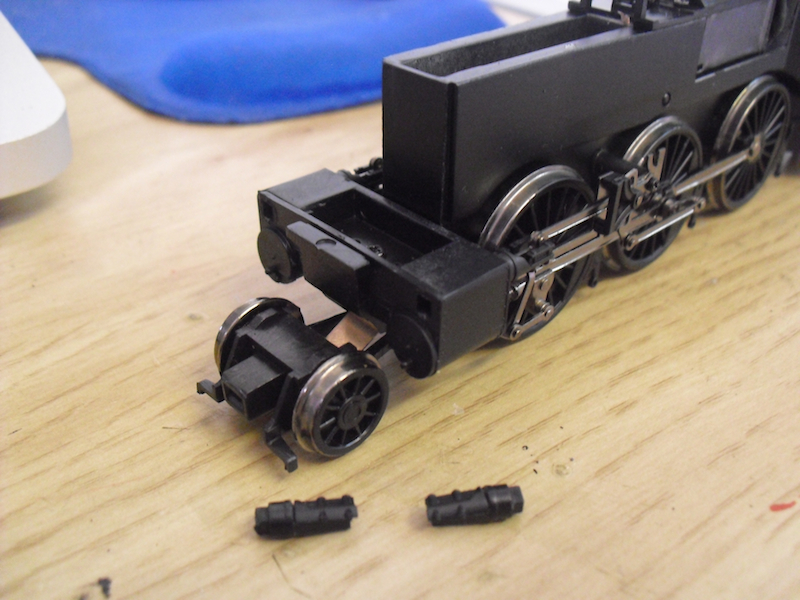 Bachmann buffers, chimney and coupling hook were removed. 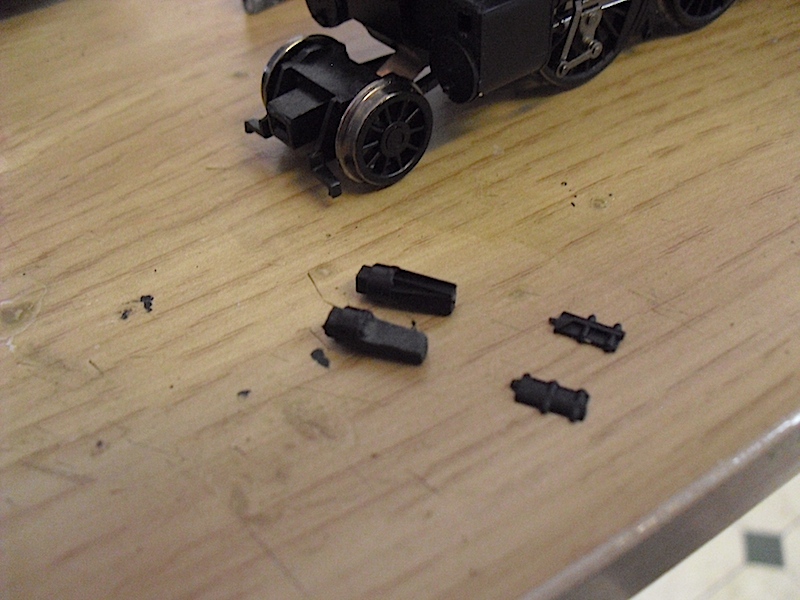 The chimney literally pops out from underneath the bodyshell, as does the coupling hook and Bachmann buffers. The Hornby buffers came from a donor A3 bodyshell of the super detail variety, and required careful cutting to preserve them for fitting onto the V2. 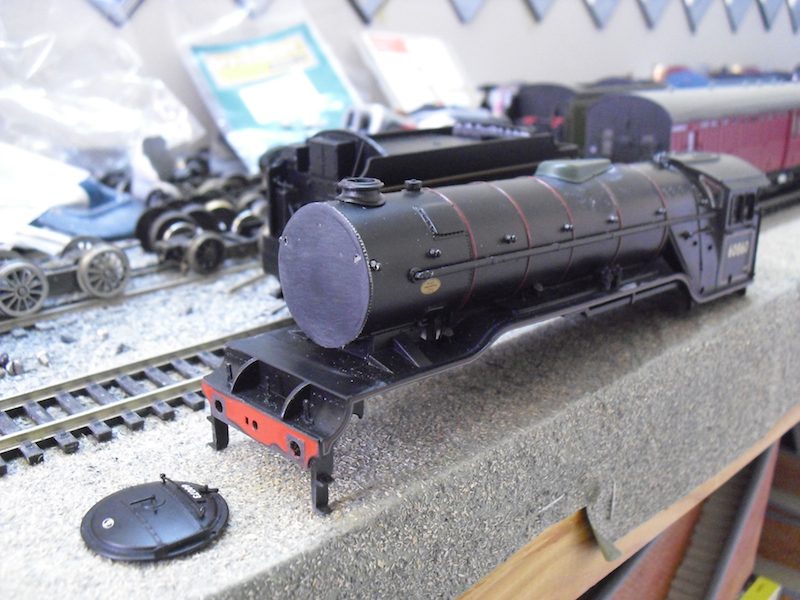 The next stage is to remove the smokebox door and door, to replace with Hornby components, taken from said donor A3 bought for spares. 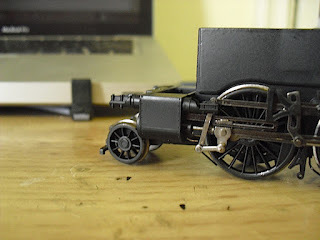 I filed down the smokebox on the V2 bodyshell, and removed the outer ring on the Hornby A3 smokebox door. This next picture shows the front end of the cylinder after the torpedo ends have been removed. 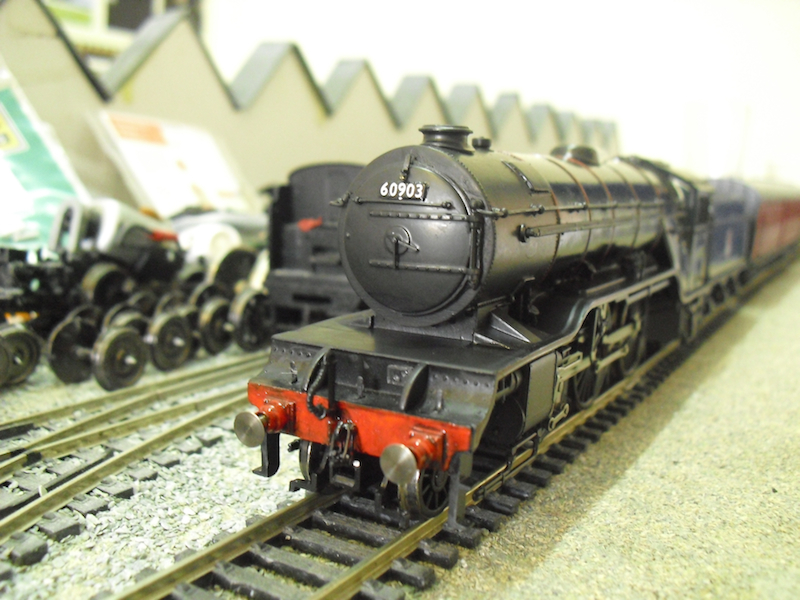 The torpedo ends are the pair on the left, on the right are a spare set from a Hornby A4 set of cylinders (and correct for my chosen V2, 60903). I filed down the original Torpedo ends enough so that the Hornby set could be stuck on top. This has two benefits - firstly, it allows the torpedo ends to simply be slotted back into the cylinders without fuss (and they fit very well, a snug fit into a square hole), and secondly it gives the Hornby ends the correct length from the cylinders. ...and as fitted to the cylinders. In my view, a modification well worth doing and improves the overall look no end. 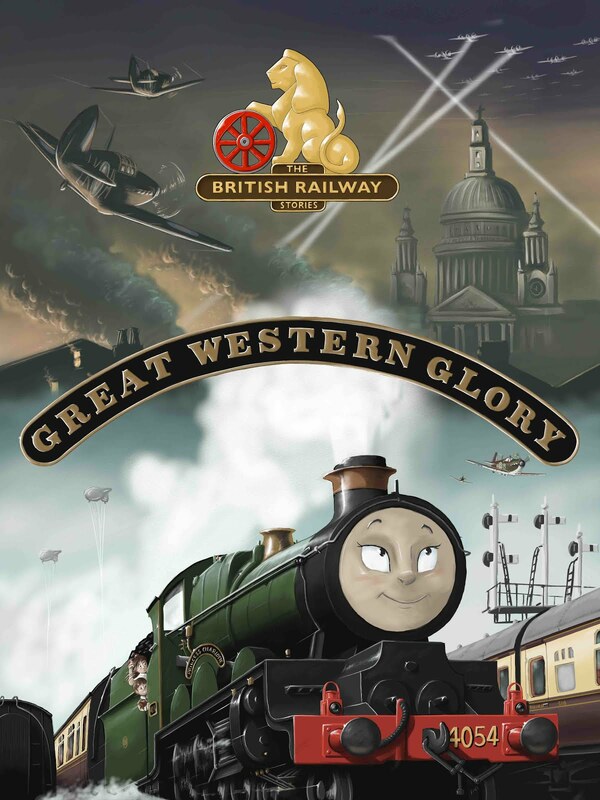 Note that the preserved V2, Green Arrow, has the original style retained. I simply removed the dome from my spare A3 bodyshell and glued it into position on my bodyshell. It required filing down of the dome enough so that the dome literally fits over the top. Using the small notches Hornby provide for placing over their boiler bands, it was easy enough to line up the dome perfectly. 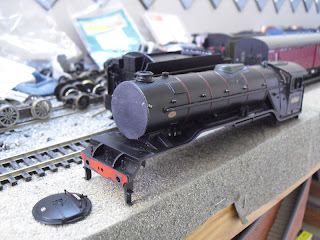 With A3 buffers, front coupling and smokebox door fitted, and brass lamp irons left over from my recent A4 projects, and the handrail wire clipped to the right length, along with the Hornby Margate made A3 single chimney fitted, the front end looks much better in my view. 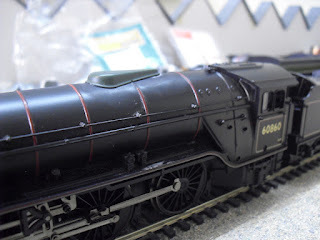 I cut the plastic moulded coal so I could add real coal later. 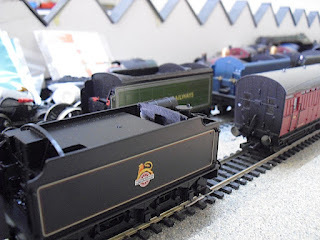 My excuse is that King's Cross locomotives nearly always went back for more coal anyway...! The finished model, with the cylinder draincocks as supplied attached. Personally I think they are acceptable enough to use, and the overall model is definitely much improved from the original. Also note the cab doors - taken from an older Bachmann V2 model (for which I have no idea where these excellent plastic doors came from). So, onto today's modelling. Final bits and bobs. Chaos Black acrylic paint was used to patch up any areas of black paintwork damaged through the modifications. Fox Transfers numerals were applied individually onto the numberplate to form "60903". One thing I should note. I have been examining a whole range of photographs of the V2s. 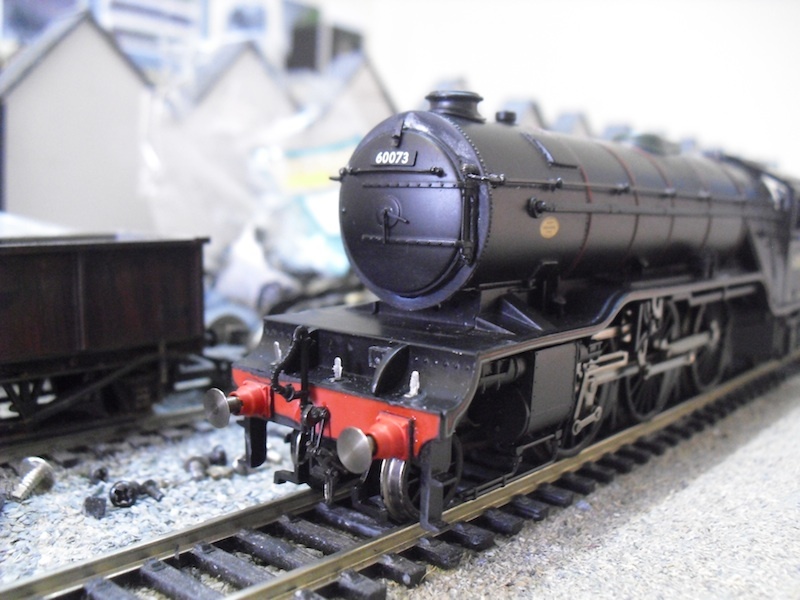 My chosen example, 60903 appears to have had only two smokebox door types throughout its life, and strictly speaking my use of an A3 type door is only accurate for a time between 1950-54. 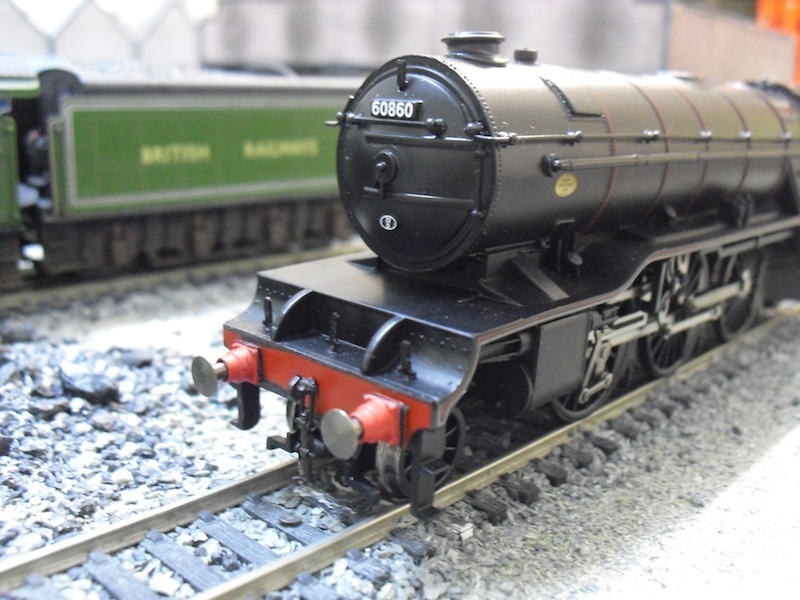 60903 had the more standard type, with flush riveted smokebox straps and door dart for most of its life. 1950 is not out of my selected time period technically, but it shouldn't in theory be run alongside any models from 1948/49 as it wouldn't have had this smokebox door type then! The cylinder ends were modified slightly to be straighter, and were refitted. The overall improvement to the front end is clear and it's a modification I think is well worth doing. I shall certainly be doing so to all of the planned V2 fleet. Cabside numerals are from the Fox Transfers range and were applied as per the usual methods, but Johnson's Klear was used to seal the numerals and also give the boiler and tender the glossy finish I was after for a King's Cross based V2. 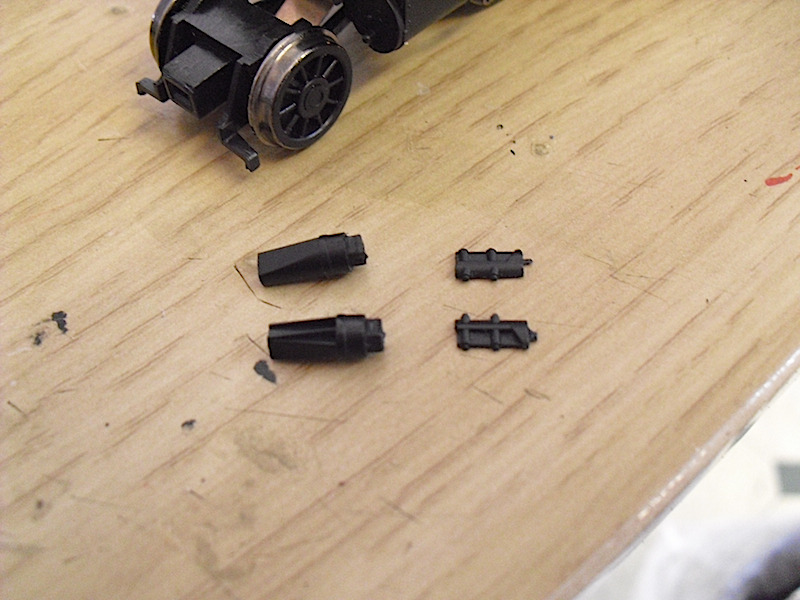 This was also brush applied to the driving wheels and pony truck set. Next time I'll work on the weathering, intended to show a clean example of a Top Shed V2.